Two different worksheets, one on writing one step equations from word problems and one on writing two step equations from real world situations. 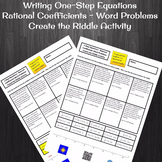 Students are asked to define variables on each of the worksheets. 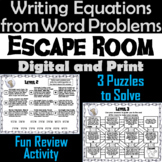 As an extension, students can then solve those equations. Answer keys are included. 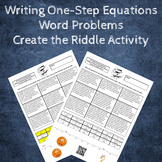 Writing Equations from Word Problems Activity! 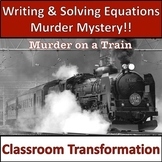 Solving Equations Mystery! 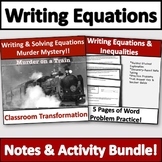 Also included in: Writing Equations From Word Problems Activity & Notes Bundle! 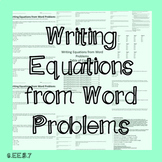 Guided notes on how to write an equation from word problems. Step by step rules and key "operation" words used in word problems. 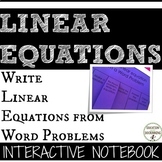 This chart has students writing equations from word problems and identifying the slope and y-intercept. 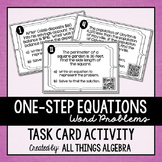 It then describes a change in the word problem and students have to determine if the slope or y-intercept changed. 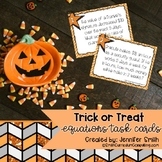 This is a class activity for groups. The class is shown a word problem (there are 4 in this file) and an equation and asked if their equation is true for the word problem and to defend their answer. I used this with my students and had better discussions than we usually have with other activities. This message decoder is a great way for students to practice their skills with writing equations from word problems that result in one-step equations. Problems include addition, subtraction, multiplication, and division. 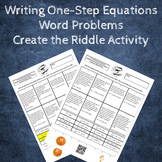 Writing Equations From Word Problems Activity & Notes Bundle!